, a celebrated commander, was born October 19, 1696, at Dresden, and was the | natural son of Frederick Augustus If. king of Poland, and Aurora, countess of Konigsinarc. He gave evident proofs of his taste for military affairs from his childhood; was taught to read and write with the utmost difficulty; nor could he ever be prevailed upon to study a few ho irs in the morning, otherwise than by a promise that he should ride on horseback in the afternoon. He liked to have Frenchmen about him, for which reason their language was the only foreign one which he willingly learnt grammatically. He attended the elector in all his military expeditions; was at the siege of Lisle in 1708, when only twelve years old, and mounted the trenches several times both at the city and at the fortress, in sight of the king, his father, who admired his intrepidity. Nor did he discover less courage at the siege of Tournay, the year following, where he twice narrowly escaped death; and at the buttle of Malplaquet, far from being shocked by the dreadful carnage which attended the engagement, he declared in the evening, “that he was well pleased with the day.” In 1711, he followed the king of Poland to Stralsund, where he swam over the river, in sight of the enemy, with his pistol in his hand, during which time he saw, /vithout any seeming emotion, three officers and above twenty soldiers fall by his side. When he retired to Dresden, the king, who had been witness to his courage and abilities, raised a company of horse for him. Count Saxe spent the whole winter in teaching his regiment some new evolutions, which he had invented, and marched them against the Swedes the year following. This regiment suffered much st the battle of Gadelbusli, where he made them return three times to the attack. This campaign being ended, mad. de Konigsmarc married him to the young countess de Loben, a rich and amiable lady, whose name Avas Victoria, which name, count Saxe afterwards said, contributed as much to fix his choice on the countess, as her beauty and largtr fortune. This lady brought him a son, who died young, and the count having at length a disagreement with her, procured his marriage to be dissolved in 1721, but promised the countess never to marry again, and kept his word. She married a Saxon officer soon after, by whom she had three children, and they lived in harmony together. It was with, great reluctance that the countess had consented to her Carriage being dissolved, for she loved count Saxe; and the latter frequently repented afterwards of having taken | such a step. He continued to signalize himself in the war against Sweden, was at the siege of Stralsund in December 1715, when Charles XII. was blocked up, and had the satisfaction of seeing him in the midst of his grenadiers“. The behaviour of this celebrated warrior inspired count Saxe with a high degree of veneration, which he ever retained for his memory. He served against the Turks in Hungary in 1717, and on his return to Poland in 1718, received the order of the white eagle from the king. In 1720, he visited France, and the duke of Orleans, then regent, gave him a brevet of marechal de camp. 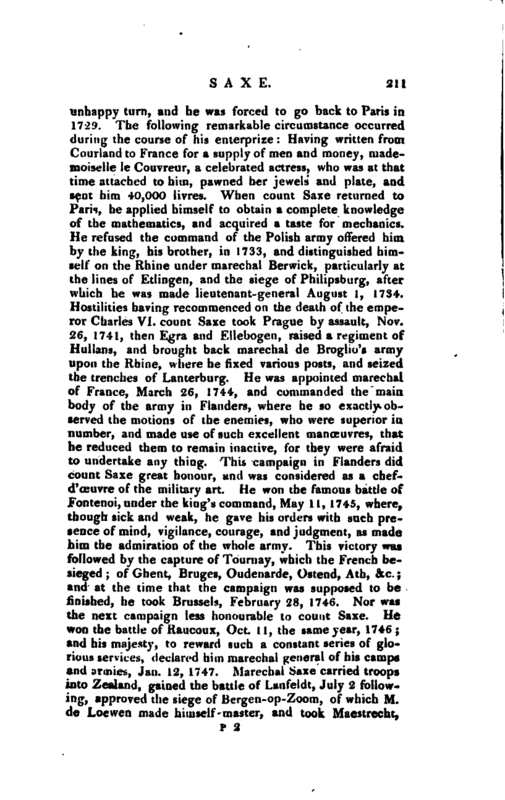 Count Saxe afterwards obtained leave from his Polish majesty to serve in France, where he purchased a German regiment in 1722, which afterwards bore his name. He changed the ancient exercise of this regiment for one of his own invention; and the chevalier Folard, on seeing this exercise, foretold immediately, in his Commentary on Polybius, torn. III. b. ii. chap. 14, that count Saxe would be a great general. During his residence in France, he learnt mathematics and the art of fortification with astonishing facility, till 1725, when prince Ferdinand, duke of Courland, falling dangerously ill in the month of December, he turned his thoughts to obtaining the sovereignty of Courland. With this view, he set out for Mittau, and arrived there, May 18, 1726. He was received with open arms by the states, and had several private interviews with the duchess dowager of Courland, who had resided there since her husband’s decease. This lady was Anne Iwanaw, second daughter of the czar I wan Alexiowitz, brother of Peter the Great. Count Saxe, having communicated his design to her, soon engaged her in his interests; and she acted with such indefatigable ardour, and conducted affairs so well, that he was unanimously elected duke of Courland, July 5, 1726. Thia choice being; opposed by Poland and Russia, the duchess supported count Saxe with all her interest, and even went to Riga and Petersburg, where she redoubled her solicitations in favour of the late election. There seems indeed to be no doubt, but that, if the count had returned her passion, he would not only have maintained his ground in Courland, but shared the throne of Russia, which this princess afterwards ascended; but, during his stay at Mittau, an affair of gallantry between him and one of her ladies broke off the marriage, and induced the duchess to abandon him. From that moment the count’s affairs took an | unhappy turn, and he was forced to go back to Paris in 1729. 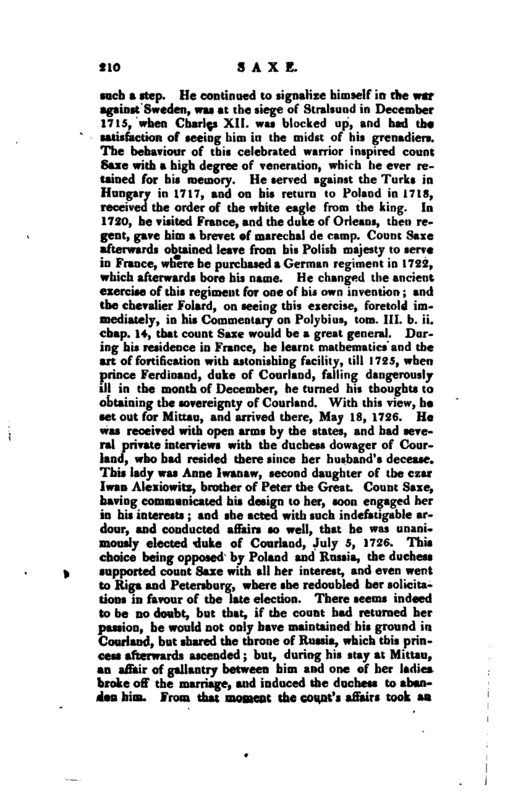 The following remarkable circumstance occurred during the course of his enterprise: Having written from Ccmrlandto France for a supply of men and money, mademoiselle le Couvreur, a celebrated actress, who was at that time attached to him, pawned her jewels and plate, and sent him 40,000 livres. When count Saxe returned to Paris, he applied himself to obtain a complete knowledge of the mathematics, and acquired a taste for mechanics. He refused the command of the Polish army offered him by the king, his brother, in 1733, and distinguished himself on the Rhine under marechal Berwick, particularly at the lines of Etlingen, and the siege of Philipsburg, after which he was made lieutenant-general August 1, 1734. Hostilities having recommenced on the death of the emperor Charles VI. count Saxc took Prague by assault, Nov. 26, 1741, then Egra and Ellebogen, raised a regiment of Hullans, and brought back marechal de Broglio’s army upon the Rhine, where, he fixed various posts, and seized the trenches of Lanterburg. He was appointed marechal of France, March 26, 1744, and commanded the main bocly of the army in Flanders, where he so exactly observed the motions of the enemies, who were superior in, number, and made use of such excellent manoeuvres, that he reduced them to remain inactive, for they were afraid to undertake any thing. 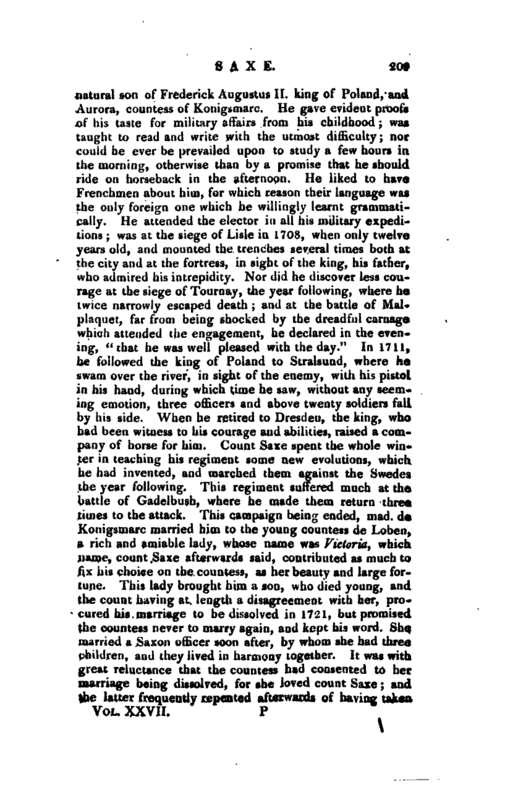 This campaign in Fianders did count Saxe great honour, and was considered as a chefd’ceuvre of the military art. He won the famous battle of Fonterioi, under the king’s command, May 11, 1745, where, though sick and weak, he gave his orders with such presence of mind, vigilance, courage, and judgment, as made him the admiration of the whole army. This victory was followed by the capture of Tournay, which the French be^ sieged; of Ghent, Bruges, Oudenarde, Ostend, Ath, &c. and at the time that the campaign was supposed to be finished, he took Brussels, February 28, 1746. Nor was the next campaign less honourable to count Saxe. He won the battle of Kauconx, Oct. I 1, the same year, 1746; and his majesty, to reward such a constant series of glorious services, dtrlurod him marechal general of his camps and armies, Jan. 12, 1747. Marechal Saxe carried troops into Zealand, gained the battle of Lanfeldt, July 2 following-, approved the siege of Bergen-op-Zoom, of which M. de Loewen made himself master, and took Maestrecht, | May 7, 1748. In consequence of these victories a peace was concluded at Aix-la-Chapelle, Oct. 18, the same year. Marechai Saxe went afterwards to Chambord, which the king had given him, ordered his regiment of Hullans thither, and kept a stud of wild horses, more proper for light cavalry than those used by the French. He visited Berlin some time after, and was magnificently entertained by his Prussian majesty. On his return to Paris, he formed a plan for the establishment of a colony in the island of Tobago; but gave it up, when he found that England and Holland opposed it. 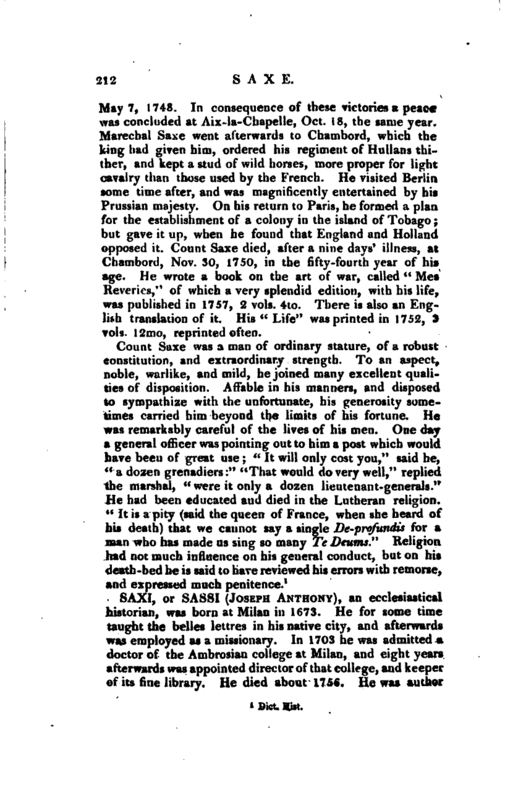 Count Saxe died, after a nine days 7 illness, at Chambord, Nov. 30, 1750, in the fifty-fourth year of his age. He wrote a book on the art of war, called” Mes Reveries/ 1 of which a very splendid edition, with his life, was published in 1757, 2 vols. 4to. There is also an English translation of it. 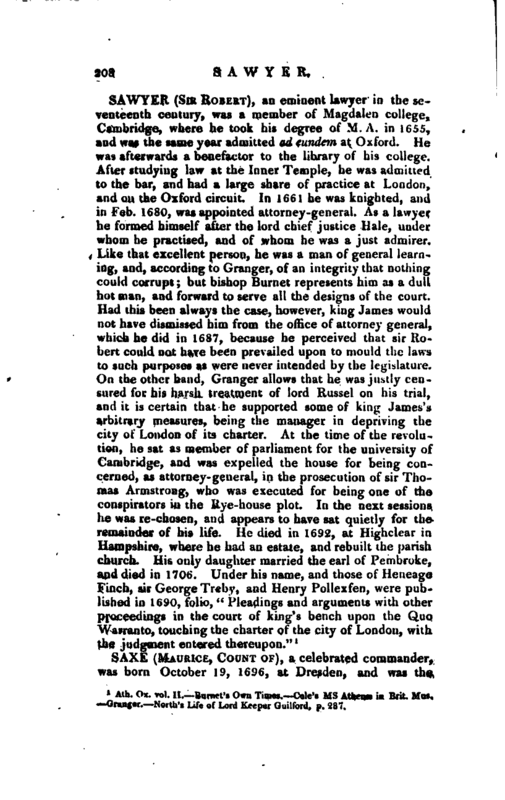 His “Life” was printed in 1752 > vols. 12mo, reprinted often.